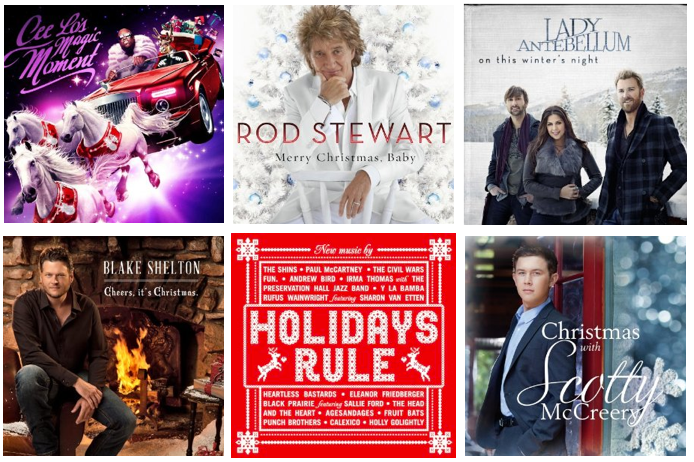 Just hear those sleigh bells ring-a-ling, and turn up the volume with one of these hot new releases on the holiday music scene. I stated my case last year, but I’ll bring it up again. Whatever you do, DO NOT gift one of these to someone as a Christmas gift unless they are receiving it BEFORE Christmas. Holiday albums make for great hostess gifts, Secret Santa choices, thank you presents, or even a crossover gift for a friend celebrating a birthday in the next four weeks…but if you give someone a holiday album on December 25th? You’re basically subjecting yourself to hearing tunes well after the merriment and mirth has passed. Just don’t do it. Who It’s By: R&B superstar and The Voice judge Cee Lo Green. Who It’s For: Your little brother that still digs the odd holiday tune, but needs the artist to have some street cred. What It Sounds Like: A slow jam, retro soul, motown-inspired journey down Candy Cane Lane…with some pretty rockin’ guest stars, including fellow The Voice judge Christina Aguilera and The Muppets! Expect a balance between boppin’ upbeat tunes and surprisingly serene takes on classics like Silent Night and Joni Mitchell’s River. Kickin’ Carol: Cee Lo’s cover of Stevie Wonder’s What Christmas Means To Me is a soulful shoutout to the season that’ll get you hopped up on holiday spirit! Originals? : All I Need Is Love is a seriously upbeat, downright club-stompin’ spangled tune, featuring The Muppets’ legendary ‘Mahna Mahna’. You have to hear it to believe it. Who It’s By: Aging pop-rocker Rod Stewart. Who It’s For: Your kooky aunt that’s known for whistling Maggie May while making Christmas dinner. What It Sounds Like: Well…his voice, as its been for the last decade, is still ebbing away, but the orchestral arrangements behind it simply can’t be beat. Play it while the snow is falling! Kickin’ Carol: Truthfully his voice works better on the album’s more reflective tunes, like White Christmas. Originals? : Red-Suited Superman is the album’s one original contribution…and it’s a little randy. What It Sounds Like: A down-home, folk-y time. Great for playing in the background while wrapping presents or baking cookies. Kickin’ Carol: I’ll Be Home for Christmas lends itself well to the band’s slightly woeful, twangy tones. Originals? : The titular ‘On This Winter’s Night‘ is actually quite lovely – lots of sparkly piano. Who It’s By: Fellow The Voice judge and Country King Blake Shelton – the only question that remains is where is Adam Levine this holiday season? Who It’s For: Your diehard The Voice fan / holiday standards-loving mother-in-law. What It Sounds Like: Surprisingly standard. This is a holiday album that won’t offend any country haters’ ears, yet also plays well to those looking for a dose of Shelton’s signature silky vocals. You won’t go wrong spinning this one on Christmas Eve. Kickin’ Carol: Keep The Voice party going and tune into his duet with finalist Xenia on Silver Bells. Originals? : The bang-a-langin’ Santa’s Got A Choo Choo Train is an offbeat, Western-tinged addition. Who It’s By: American Idol alum, Scotty McCreery. Who It’s For: Your mom – even though she doesn’t love country, she certainly fell for Scotty’s sweet country charm when he was on Idol back in 2011. What It Sounds Like: Straight up country Christmas – the fiddle, banjo, and Scotty’s drawl are all stars on this disc. If you’re hitting up a sleigh ride at some point this holiday season, this’ll suit any barn atmosphere just fine. Kickin’ Carol: Santa Claus Is Back In Town – not a super well-known song as it’s an Elvis original, but Scotty’s twang-rock take is tons of fun. Originals? : Christmas In Heaven, for all you good country Christians out there. Who It’s By: Seventeen various artists, primarily (but not exclusively – Paul McCartney anyone?) of the indie persuasion. Who It’s For: Your hipster coworker that wears dorky Christmas sweaters ironically. What It Sounds Like: A mish mash of styles that somehow work together, and don’t completely butcher the holiday classics featured on the disc. In fact, most of the versions here are downright terrific. The perfect disc when you want to set the seasonal mood, but don’t want to incite eyerolls. Kickin’ Carol: Breakout indie pop stars fun. do an awesome mash-up on opening track Sleigh Ride – managing to keep the song’s upbeat, cheesy lyrics in tact while mixing it with an electro-wind melody. Originals? : I don’t think so, but some of the tunes are certainly off the beaten path – like Santa, Bring My Baby Back (To Me) and Senor Santa. Of course there are a handful of other new releases out there, including the one I featured the other day, plus Colbie Caillat’s tropical-infused Christmas In The Sand, and indie pop artist Christina Perri’s EP.